Born in Indiana and educated in Georgia, Greg Hoard came to Cincinnati in the winter of 1979 as a columnist for the Cincinnati Post sports department, and joined the Cincinnati Enquirer in 1984 as the beat writer for the Cincinnati Reds. He has received numerous awards for his work. In 1990, he left journalism for television. Hoard worked for WLWT-TV from 1990 through 1993 as sports director and spent 12 years as sports director at WXIX-TV. His written work has appeared in Sports Illustrated, The Sporting News, Baseball America, Baseball Digest and NFL Game Day. He has appeared on ESPN and NBC’s The Today Show. Greg is the author of three books: Joe, Rounding Home and Heading for Home; Gary Burbank, Voices in My Head; and, most recently, Hannan’s Way, An Unlikely Trek Through Life. He is currently working on a baseball memoir, parts of which he will share here. Buckeyes debut an all new infield and a new man in center, and amidst all this Jake Vance adds to his growing reputation. OSU tunes up before heading to Penn State. 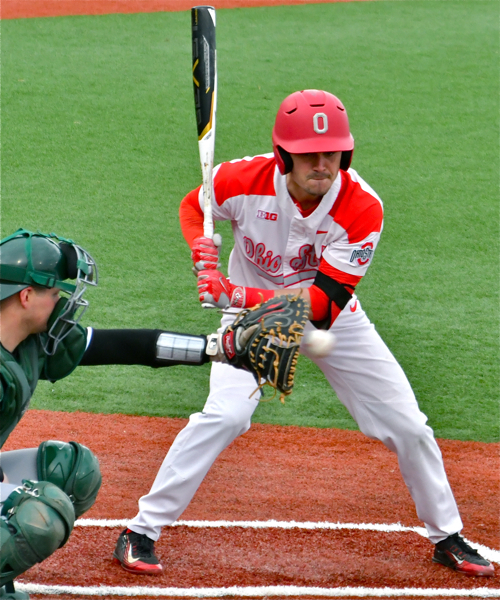 COLUMBUS – Ohio State unveiled a new defensive alignment Tuesday night at Bill Davis Stadium, an alignment designed for long term benefits, but the dominant figure on the field and in the game was starting pitcher Jake Vance. 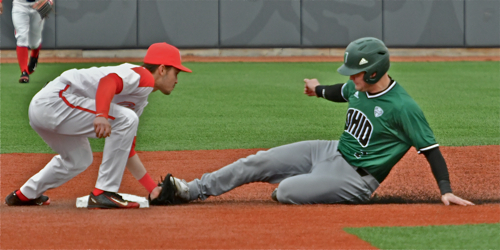 The sophomore right-hander collared Ohio University for 5.1 innings, allowing just three hits, giving the Buckeyes a solid foundation for 4-0 win over the Bobcats, now 15-15. It was Ohio State’s first shutout of the season, and after a dreary weekend at Iowa where the Bucks dropped two-of-three, it was a nice and necessary win. 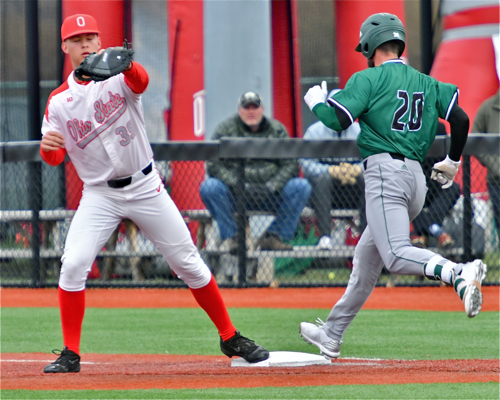 Now 21-10 and headed to Penn State this weekend, the Buckeyes lineup contained five changes: at first, second, third, short and center field—all changes precipitated by Ohio State’s defensive shortcomings. But for all that and as much dust as the Bucks’ defensive play has stirred up, on this night Vance simply stole the show. Primarily, he used a fastball/change-up mix with a sprinkling of breaking balls to basically disarm the Bobcats. Vance’s work has, to a degree, been somewhat overlooked. He’s 3-1 with a 1.71 ERA. His ERA is second only to closer Seth Kinker who sits at 1.65. Kobie Foppe had one hit, scored one run , and got on base with a walk. Tuesday night’s start was his third of the season and his eighth overall appearance. Clearly, he’s a building block for the future and he very well could crack the weekend rotation if there’s an injury or a breakdown. “I was just trying to mix my pitches—the fastball, change and curve,” Vance said, “and everything was pretty much working for me…I think most of my strikeouts (six) came on the fastball. Mostly, I was just trying to locate my pitches. It was a clean game, which leads us to those line-up changes. Ohio State did not commit an error, though the Bobcats weren’t exactly knocking the ball all over the park and testing this new alignment. The wind and the 44-degree weather served to kill a few fly balls and restrict base hits. There were a total of 12 hits in the game, and Ohio State made the most of its opportunities. In the fifth, Jacob Barnwell started things with a one-out single up the middle, after the wind killed a fly ball by Noah West, Dom Canzone singled to left. Kobie Foppe drew a walk to load the bases for Noah McGowan. 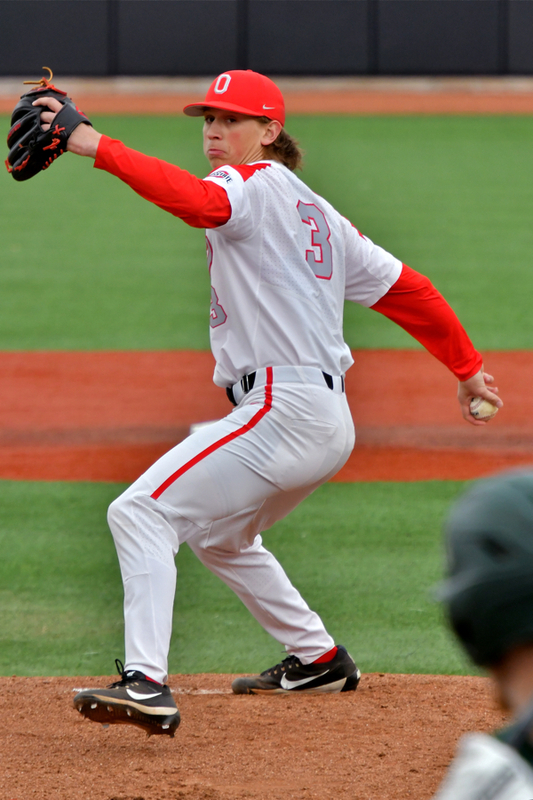 Connor Pohl adjusted well in a new position for the Buckeyes at first base . McGowan, batting .410, finished a seven-pitch at-bat with a single to left scoring two runs and putting runners at first and third. Conner Pohl followed. He got a pitch away and punched it to left field for a single and it was 3-0 Ohio State. Brady Cherry, the designated hitter, singled to open the sixth. Dillon Dingler, who started in center, followed with a hit-and-run single, putting runners at first and third. Barnwell grounded into a force at second, good enough to score Cherry, and that was the extent of the scoring. 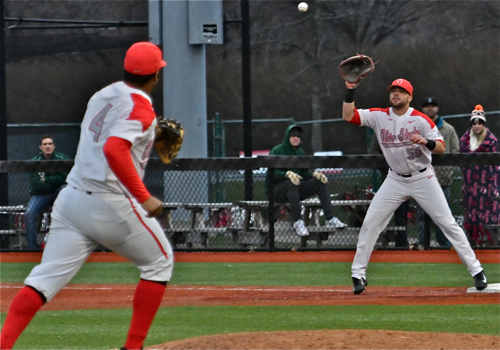 While Vance’s performance and the shutout, completed by Thomas Waning (2.1 innings), Andrew Magno (one-third of an inning) and Yianni Pavlopolous (two-thirds of an inning) was noteworthy, the changes in the defense came as a long-awaited attempt to shore-up the most significant weakness in the Buckeyes’ game. 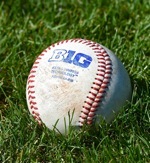 Their 51 errors is worst in the Big Ten and among the very worst in the country. Entering play Tuesday their .954 fielding percentage ranked 269th in Division I play. For weeks, Beals has considered changes and, in the end, he did not make these changes without exhaustive consideration. Noah McGowen, new in his position at third, flips the ball to Bo Coolen for an out at first base. Finally, he said, he arrived at an alignment that “freshened things up, for sure, at the corners,” shifting Pohl from third to first and McGowan from first to third. Furthermore, Beals said, he believed moving Foppe to second and installing West at short, put both players at positions where they performed best. This, of course, put Cherry in a role as designated hitter. Cherry had committed 11 errors at second base and his average had dipped to .239. The shocker, for some at least, was Dingler, the back-up catcher, starting in center field, where he handled himself capably and certainly looked the part. Noah West makes the tag on a Bobcat steal attempt. Beals characterized all the moves as decisions he made to put the team in a championship position. Will they stand? Will some stick and others not work out? Only time will tell, but it was certain Ohio State could not continue to give opponents extra outs and so many free bases. Already, it has cost them a handful of games and this season grows shorter by the day. 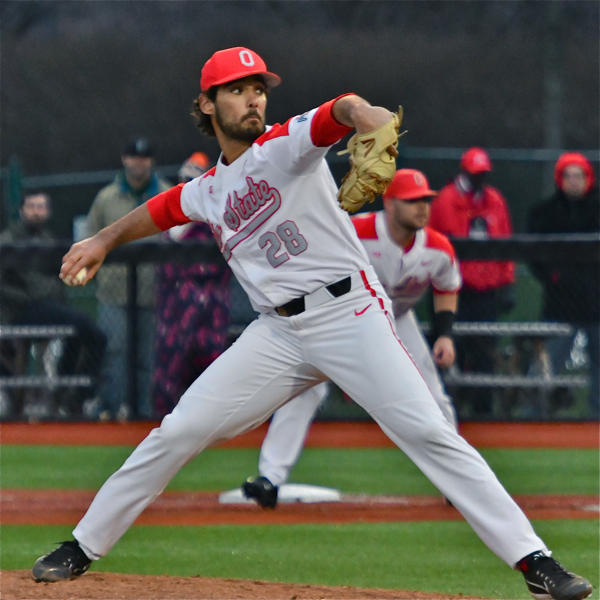 Yianni Pavlopolous pitched two-thirds of an inning contributing, to the Buckeyes 4-0 win over the Bobcats. United Building Materials is proud to sponsor coverage of area basketball on Press Pros Magazine. com.